Do you know what happens when you have four young children? Family invitations to dinner, to parties, to get-togethers, to people's houses - they dwindle down to about nothin' as your family grows. Maybe the two oldest can come over to play? Hey, would you all like to go out to dinner - leave the kiddos at home? How about we meet at the park sometime - where it's not so crazy? I get it. I totally get it. Kids are rowdy. They're whiny. They're crazy and needy and they make a mess. Multiply that by four, add in two parents who try to smile and nod nicely while discreetly trying to wipe off mashed potatoes that one of their children has smeared under the table - and well, it's not really a "dinner party". It's a "chaos" party. It's a "lay it all out there for everyone to see" party. It's a "No wonder no one wants to invite us over" party. As my husband and I have contemplated this, we've decided that while we're raising our young children, we're gonna embrace the chaos. We're going to swing open the doors of our home, and invite our friends over who have oodles of children - just like we do. And, we're going to lay our lives open in the spirit of loving one another during this season of life, loving our friends' children, and just sharing life together. So, this past weekend, we threw a Gingerbread House Decorating Party for our friends. Yes. 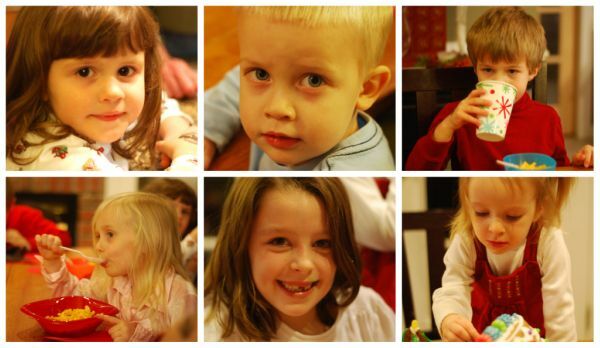 FOURTEEN children - all under age 10. Do we live in a mansion? No. Do we have nannies and maids to clean up? No. Did we have a herd of teenage babysitters on hand to help? Nope. It was our family. Our friends. And, all of their children. 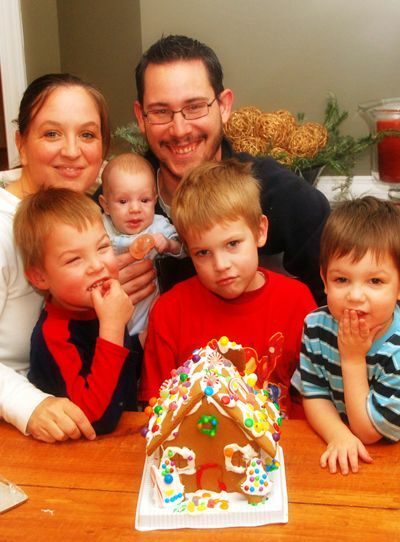 We asked each family to bring a Gingerbread house. I made a big pot of macaroni and cheese (the boxed kind that kids LOVE!) and two large pots of chili and our friends brought the fixin's. It was a perfect, easy meal. 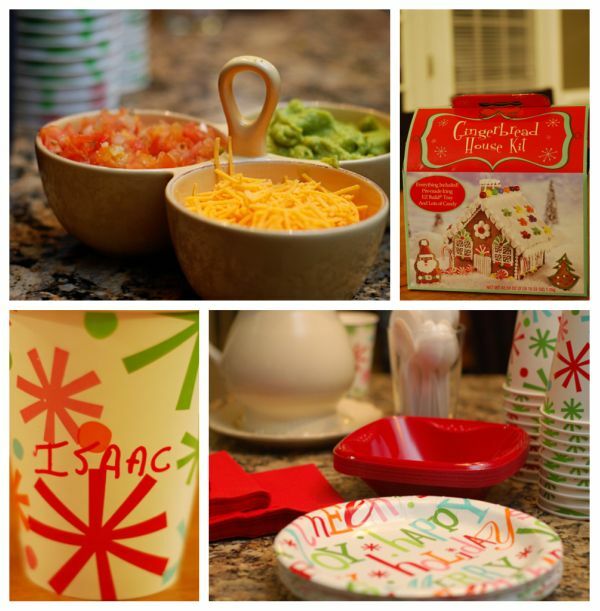 Paper plates, paper cups, plastic bowls, a red marker - I kept it really simple. We ate - very casually - sitting and standing all over the kitchen and family room. 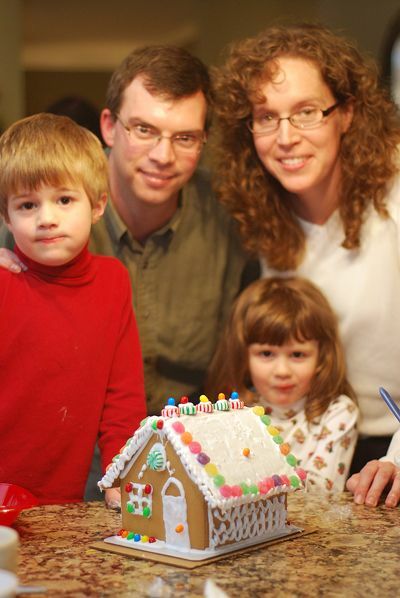 Then we broke into our Gingerbread houses. We set up stations all over our kitchen - three families at our kitchen table, one at the island, and one at our white kids' table. And, we decorated. Oh, did we decorate. Creativity was at work all over the room. Icicles, Santas...sliding roofs? We just laughed and went with it. We coated the place in icing. We laughed. We encouraged our kids. We passed the baby around. We made fun of the engineers and their meticulousness. We didn't care about pretenses. We didn't worry about being judged. We were...we ARE all in the same crazy boat. 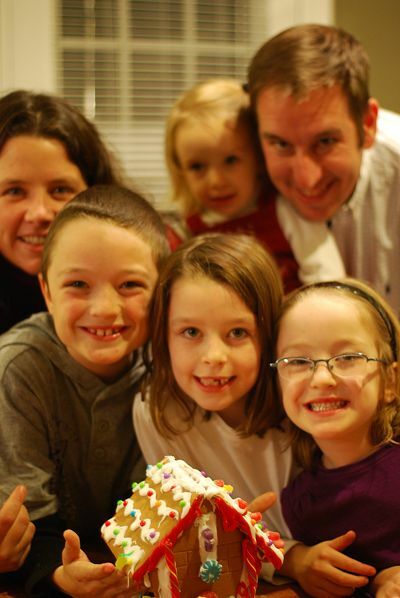 At the end of the night, our five families each had a Gingerbread House. 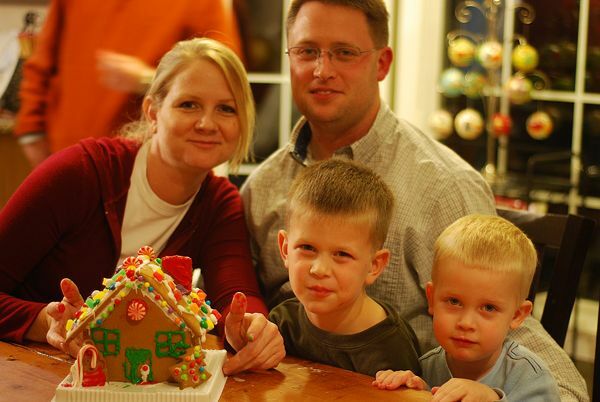 A high five to Beth and Jeremy and their family - who we all agree created the prettiest, most perfect Gingerbread house of the night! Yes, Jeremy is an engineer. We felt compelled to make fun of him. We all had Gingerbread House envy. But, even more than our decorated houses - we left with memories of a night filled with fun and laughter - in our new town with our new friends and all of our children. All 24 of us - embracing the crazy and spending an evening together - eating, decorating, drinking coffee - and celebrating our friendship this Christmas season. And, these precious little faces? What a treat for them. What gifts they are to us and our kids. We loved having them in our home. We plan on having them here a whole bunch more. Love it, Sar! It looks like you had a blast. I did have to giggle, though, about the "white kids' table," 'cause it sounds a little like you have a table that hasn't yet been integrated. :) Miss you friend! 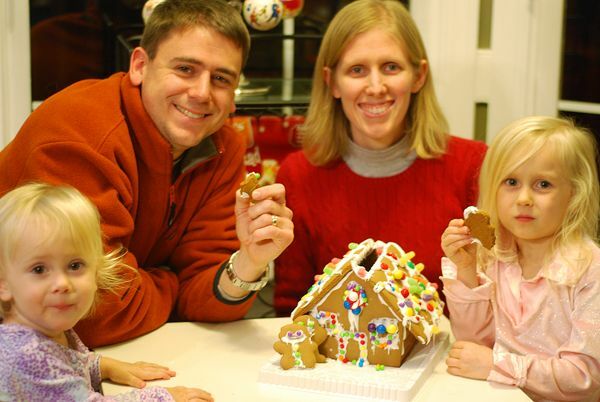 Several years back I baked 10 gingerbread homes. One for each of our children, one for each child in our friend's family, and three extra, one for Verne and I to do later by ourselves, and two for the neighbor girls who led a less than fortunate life. We had our friends in- I served hot dogs and macaroni and cheese, and then we got busy. Each child got to create their very own house. And they were thrilled! thats awesome sarah!! i am so with you with not being invited out very much with such a *big* family. how did 4 children, ONLY 4 children suddenly become a big family? what about those with 8 children? 10 children? I love it! We are the same way. Once you embrace the chaos, it's so much fun. :) Last night we did this with 9 kids & 8 adults. Next year the number of children will be even larger as our families grow! Just love this post Sarah. So glad you have such good new friends who you can really relax with. What a great thing to do - and hope your nice new kitchen survived!! Still, those memories are so much better than a "never been messy" floor! Fabulous! I love it! I need to try that with my boys next year!! Oh, yeah...I appreciated the mentioning of coffee. Yum! This looks like so much fun. I actually kind of want to do it too. We just hang out with other large families or people who know and love our large and busy family. Thankfully, our community is huge and welcoming and we are rarely without an invitation to join in someone's fun. But we should still be more proactive about inviting people to our house. I love this idea. Shame on you for making fun of the engineers! Since when is meticulousness a bad thing? Attention to detail and striving to do your best--even when it requires cleverness and forethought--should be things that should be pointed out to children and encouraged, not made fun of and discouraged. 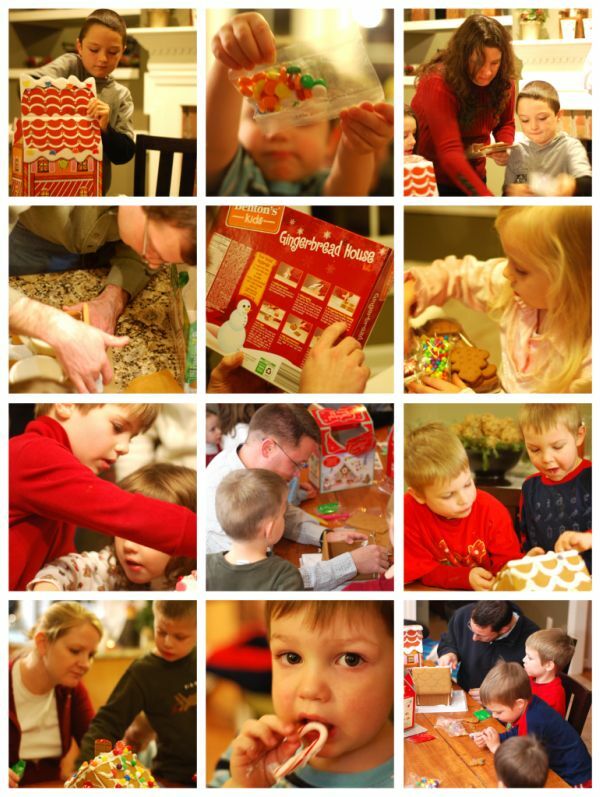 We have done gingerbread parties for 10 years now and pretty much have it down to a science--the prep part. The actual decorating party is so fun. This year we made over 40 houses so far for four parties and I have one more small party to go with only five houses. I am going to post my recipe and tips. It is a great tradition! Sorry, "Jingle Bells" is one of Adeline's favorites, and it's stuck in my head. 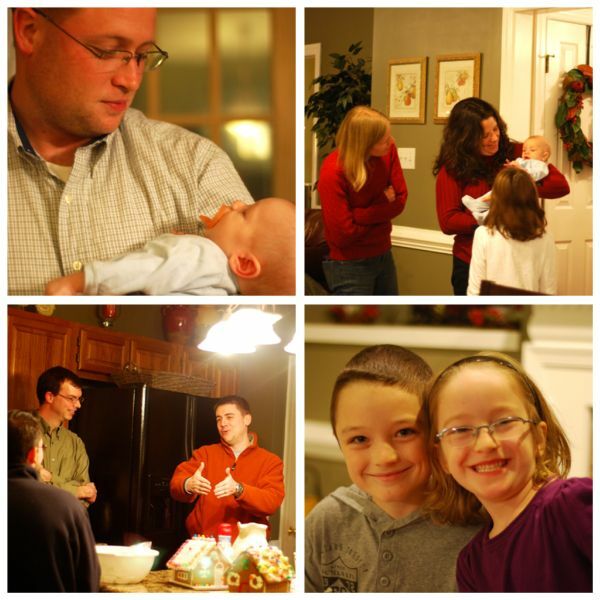 Interesting commentary on how many dinner invites decrease as your family grows. Looks like you pulled off yet another crazy fun party! That looks like my kind of night! :) I just recently hosted a Gerber Generation Celebration House Party and we had 6 adults and 9 kids and I thought that was crazy. I love to have all our friends over as often as possible I think it shows our kids how to be hospitable to others, and it is loads of fun!